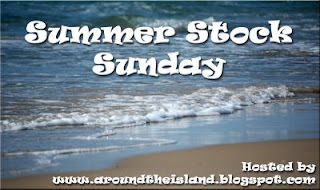 Well here we are with the first Summer Stock Sunday for the year 2011 sponsored by Robin of Around the Island blog. Fun in the sun at Bay Terrace Country Club pool! Hello Mary, it's good to connect with you again! Yes, a pool definitely speaks of summertime! The title...Sneaking In.... says it all. Everyone looks happy to be wet! The red and blue umbrellas add to the scene. Yay, it's summertime and time to head back to the pool! Our pool is oriented the same way but I always end up coming in from the other side (closer to the gate, we usually sit in chairs out on the grass and then come in to swim) so this was a bit disorienting for a second LOL. So glad you're playing along again this year Mary! That would be something for me right now, it's so hot here !! Maybe I'll participate again in this meme just like last year. This would have been perfect here yesteday! Today, overcast and gloomy. Ah well, the sun will def be back! Perfect way to spend a hot day! wow, back in the pool already? we went to the swimming hole once so far, but only to dunk our feet in - it was COLD!